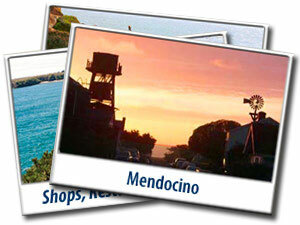 Mendocino is the only town on the California Coast that is designated an Historical Landmark. Established in the 1850's the architecture is reminiscent of Maine with its grand Victorians and quaint Saltbox cottages. Flowers grow lush and many of the Mendocino Inns offer beautiful gardens to enjoy. 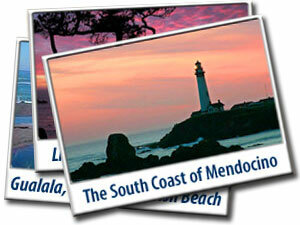 Mendocino is a photographers paradise, everywhere you look there is another picture postcard waiting to be snapped. From crashing waves and old-fashioned water towers to flower covered picket fences and sandy beaches - just some of the magic that makes Mendocino unique. Little River has an unique attraction in its Van Damme State Park. 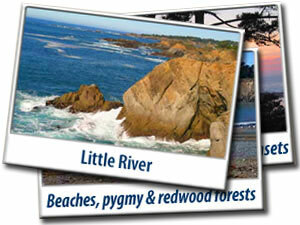 There are three distinct parts to this park; the beach is a favorite for kayakers and abalone divers. The east portion of the park features a paved trail through picturesque towering redwoods that progresses into a hiking trail that loops through a pygmy forest. . The nutrient-poor, highly acidic clay hardpan soil that is found at this level of the Mendocino Coast terrain is relatively inhospitable. As a result, the trees are dwarfed; some mature trees are barely waist-high even though they are hundreds of years old. 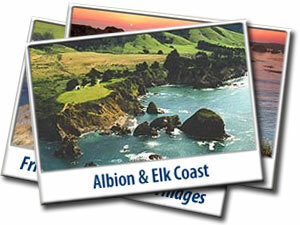 The quaint villages of Albion and Elk are found on either side of where Hwy 128 meets the Pacific Ocean. If you're turning south on Hwy 1 from 128, you'll discover the offbeat village of Elk. 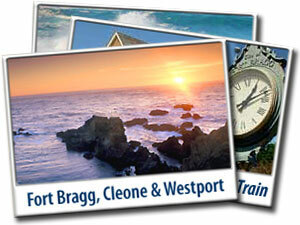 It's a lively close-knit community and one of the most pleasant oceanfront hideaways you'll ever find. This charming hamlet is perched high above the Pacific Ocean on sparsely populated scenic bluffs. Even residents can't agree on how to pronounce their town's name. Most of the old timers and locals say "Wah-Lah-Lah". Gualala is the Native American word for "water coming down place". This area is appropriately named because of the Gualala River that flows majestically into the pacific ocean creating a wide river mouth.